These photos are taken a couple of days ago. 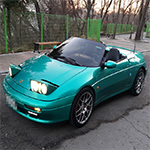 Mostly I parked my Elan in the winter and drive only in the spring to autumn - only few times. During the lunar calendar new year break, I brought up my Elan and checked everything's working - still works fine. Looks great !! What are the roll bars and wheels ? Olympic logo style tail lights are differnt fom M100 - Korean Elan has those OEM lights. simonbuk wrote: Looks great !! What are the roll bars and wheels ? Simon, roll bars with wind defelector was custom-made by Korean company, which is no more manufactured. Rims are after-market ones - 17 inch with PCD 100 by HRE Performance.